Painting is a huge hobby of mine. When you see my desk you will see a virtual art gallery. 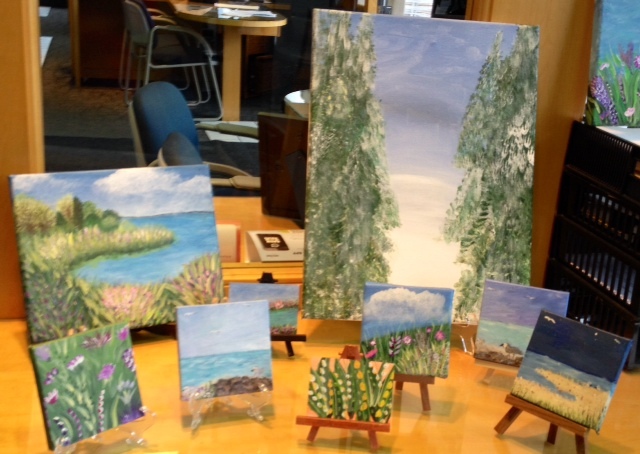 I find my paintings calming and enjoy having them to look at. 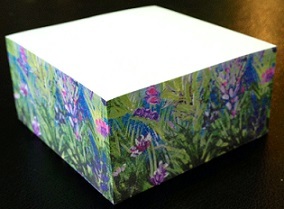 This Sticky note cube, created from one of my original paintings is a gift I give when someone buys a car from me. The inevitable question, after someone asks if I was the painter, is, “How long have you been painting?” Well, since they asked, I tell the whole story. Want to know the whole story? OK, would you please “Like” or “Follow” this blog? The first thing you need to know is that I never had any creative talent, that I knew of. I worked at Marriott Hotels for 12 years, and left in 1991. During the next ten years I had a lot of different jobs. I didn’t know why at the time, but I just wouldn’t stay in a job. I am great at interviewing and got every job. The variety of jobs would astound you. It was during this time, I wandered into a craft store and looked for something to do. Trying to keep a long story short, just know I did various crafts. I loved the Monet painting that hung in my room and decided to see if I could paint like Monet. I know, LOL. The technique for me was using dots. Once in a while, a painting came out pretty good. As the years went on, and the jobs kept changing, my interest in painting continued. Now, here is the wildest part of the story and the reason I believe my creative interest was piqued. In 2001, I found out I had a brain tumor. Yup, a brain tumor. In fact, little did I know this tumor had been slowly growing for 10-15 years. WOW is right. I am doing great. I was lucky to have a benign tumor. However, the brain tumor temporarily changed my personality. It turns out my lack of drive, and motivation was due to the tumor. Your next question is probably, how did I finally find it, right? Sure, I had horrific headaches, but since I was a kid, I always had headaches. I didn’t pay attention to the severity of the pain. One day, I decided it was time to see an eye doctor. Again, trying to keep the story short, the Ophthalmologist, couldn’t get my right eye to see better with any lens. Nope, it wasn’t here that I found out about the tumor. I was sent to have blood tests for a multitude of diseases. The good news was that every test came back negative. So, if that was the good news, what was wrong with my eye? Next step is an MRI. Yes, there it is a 1cm Meningioma. In 2001 I had 90 % of the tumor surgically removed and radiation to get rid of what was left. I am happy to report that I am doing great today and have a check up MRI every five years! My personality change was reversed, I regained determination, focus, drive and motivation. This may sound strange, but I was grateful to find out what was going on with me and that I found a creative part of me I never knew about. The medium I use is acrylic on canvas. You can see additional paintings and purchase products created from my paintings that make great gifts at, bsgcreations.com.